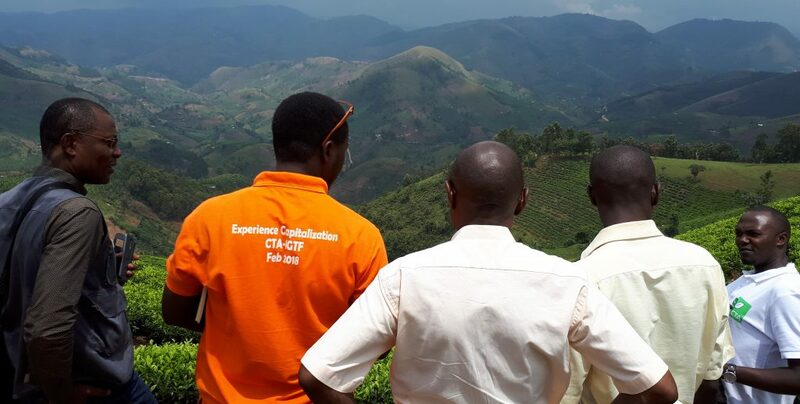 As part of its programme to support the development of local agribusiness enterprises, CTA worked in 2017 with the National Union of Coffee Agribusinesses and Farm Enterprises (NUCAFE) and the Igara Growers Tea Factory (IGTF) in Uganda, in both cases supporting the delivery of better services to their members. 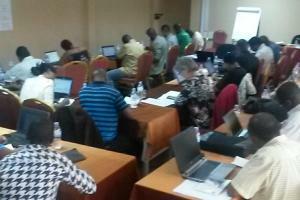 Both organizations joined a training process that would help them profile their members, something that included the acquisition of geo-referenced data, the development and management of databases and of an open source GIS (QGIS), and also a way of setting effective data flows from the field (enumerator) to the agribusiness data centre. A company based in Kampala, ESIPPS International, was hired to run the process. Its activities covered the development and rolling out of (spatial) data management systems that included the use of drones for crop scouting and mapping purposes. The collection of data using drones started in November, both on coffee as on tea plantations. In a relatively short time, both organisations were able to set up a functional data flow, and also a geo-referencing and visualisation process. CTA was therefore interested in a capitalization process that would help draw lessons regarding the establishment and use of these systems, all of which could be shared with others. An Experience Capitalisation workshop took place in Ishaka during the third week of February 2018. 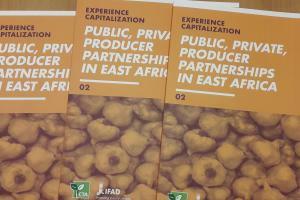 Our main objective was to present the main concepts and ideas of a capitalization approach, present a general methodology, and start an experience capitalization process with the representatives of IGTF, NUCAFE and ESIPPS, and also with those coming from the MUIIS project in Uganda and from FEPAB in Burkina Faso. 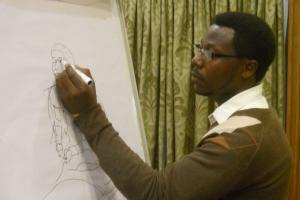 This workshop ran during four days, following the same method and approach tried in the past. 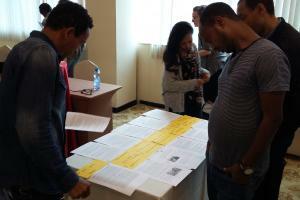 Participants discussed the concepts, principles and methodology, and started their own capitalization process. 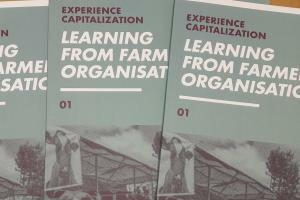 Starting with a general definition, we looked at experience capitalization as an approach that leads to lessons and “new knowledge”, and which therefore helps projects improve what they do, and also inspire others. 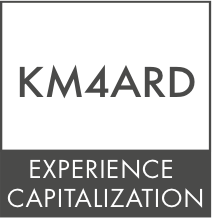 We had a short discussion about the need to “do” knowledge management, about the advantages that this brings, and about an experience capitalization approach as part of a broader strategy. We looked at the set of activities which participants wanted to describe and analyse, encouraging them to pick an “experience” that meets a few conditions: one that they know very well and for which there is sufficient information, one which has the potential for sharing lessons, and one which is particularly interesting, and for which there “is demand”. Each one was then asked to draw the boundaries of this experience, outlining the location and the time period in which each case was / has been implemented, the objectives, the main strategy, etc. Next, we talked about the need to describe every case in detail, for which it is necessary to collect information from the field, and then organise this information. We talked about timelines and templates, and then asked all participants to fill a set of tables, highlighting everything that was done, all the results achieved, and also showing the main difficulties found. This brought us then to the analysis. As in all previous workshops, this was presented as the most important step in the process, and perhaps the most complicated one. We stressed the need to differentiate an analysis from a description, and the need to use a set of criteria to help each person involved give an opinion. Participants were then asked to fill in a third set of tables, focusing on the main reasons behind the results seen (or behind the lack of results): what were the factors that helped us do what we did? 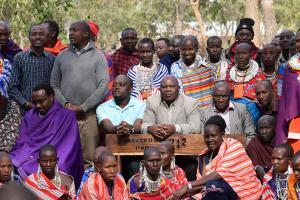 This was complemented with a field visit to the Buhweju Tea Factory and to the tea plantations in the region. Participants were guided through the factory where fresh tea leaves are delivered and transformed into black tea, and packaged for export, within 18 hours. This was followed by stop-overs at the tea gardens where participants had the chance to talk to the farmers, and get their opinions. A short drone demonstration took place as well. Completing the process, we had a short discussion about writing, discussing the best way to present the information found, and the general factors that make a “good article”. We discussed the importance of having an audience analysis, clearly identifying those persons or institutions we want to target. We then invited all participants to write a short piece, drawing on the information they had collected and added to their tables. Either individually or in pairs, they all prepared a 500-word piece, all of which are now being completed. But this was not the only way we shared information: the CTA team ran more than 10 video interviews with those involved in the process. And all participants were invited to present their cases on camera, while the group provided feedback on the presentations. It was clear that their confidence in presenting their experiences had grown significantly during the course, and the key facts were presented more concisely, paying more attention to the necessary figures and evidence. 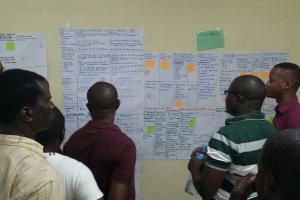 Participants mentioned that the planning process, and the four-day discussions and interactions among them, helped them develop the necessary skills to start and complete a capitalization process, and to draw lessons by doing it. We have a set of cases that are being described and analysed, and a long list of lessons to share between the different projects and also with CTA. Articles will soon be posted on the Experience Capitalisation blog, and will be included in the issue of ICTupdate that will come out at the end of the year. • the enumerator training process should address more staff than needed, as selection may be necessary based on performance. 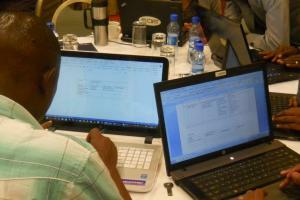 • QGIS printouts proved to be valuable in getting support and in impressing financial services. After an initial planning phase (0), the process starts by sensitizing farmers (1), using both radio programmes and face-to-face meetings. Next comes the identification and training of enumerators (2), considering that not all of them may be able or willing to continue. Enumerators interview farmers (3), informing them of the process and of their rights. 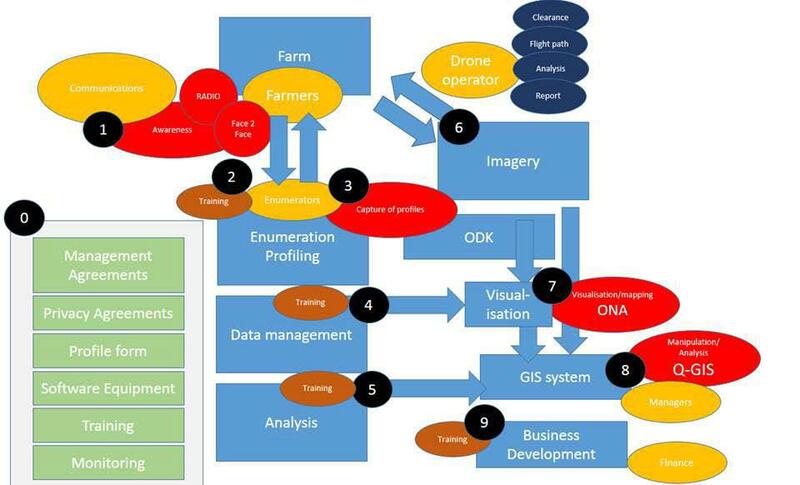 This is followed by the data management training (with the ONA software, 4) and the GIS training (5), after which drones are used to make images of all farms (6). The team needs them to manage the ONA system (7) for the duration of acquisition, and goes on to analyse the GIS data (8) to develop new services and improve business. A last step considers the development of specific business skills (capacity building), especially covering the use of financial software (9). 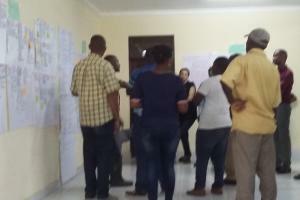 The experience capitalization workshop which took place in Ishaka, Uganda, during the third week of February 2018, included a peer review session. This time we did this orally: every participant talked about his or her work for a few minutes, and this was recorded in a short video.